A kitchen renovation can bring a weird mix of excitement and overwhelm. In a good way. For weeks you’re consumed with dilemmas: Side by side or french door? Patterned backsplash or no? And of course any decisions involving pendant fixtures could set you back a few sleepless nights. While achieving a kitchen full of pretty can make you giddy, did you also know it can help you eat healthier? Whaaaaaat? Yep, it’s true. While it won’t slap the donut out of your hands (yet…that technology is probably only a matter of time!) a strategically designed kitchen can help make it EASIER to do the things you need to do to have a healthy diet. And if it’s easier to do, you’re more likely to do it. Before you dive headfirst into the paint swatches, think about all of the healthy eating habits you have (or wish you had.) Now think about any obstacles your current kitchen gives you when trying to accomplish these daily tasks. What needs to be different in your kitchen to make these habits stick? Make a list and take it to your kitchen designer. That “every now and then” green drink could become your “daily green drink” if the blender was already set up and ready to go on your countertop. 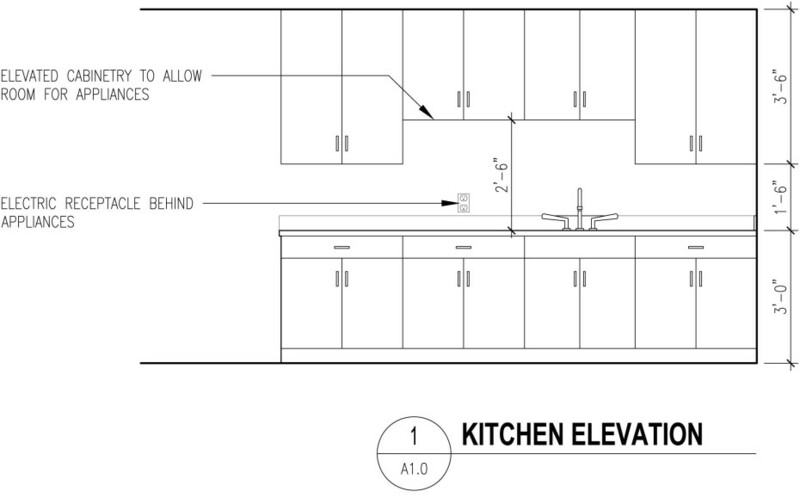 The typical height between countertops and upper cabinets is between 16”- 18″. This presents a problem when many high powered blenders are somewhere around 18-20” tall. You’re forced to either store it elsewhere, or at the very least, have to pull it out from under the cabinets to put the carafe on so you can use it each time. Certainly not a huge deal, but if you can eliminate those extra steps, why not? Especially if it gets used on a daily basis. Once you’ve determined where you’ll keep the blender on the counter, don’t forget to tell your designer & contractor you want an electric receptacle directly behind it. This way there are no visible cords on your countertop. If you’re on any semblance of a healthy diet you find yourself washing fruits and veggies constantly. Eliminating the act of rooting around in your cabinets to retrieve the salad spinner (which inevitably always seems to be under a pile of EVERY other dish you own) will make the process faster, and therefore more likely to happen. 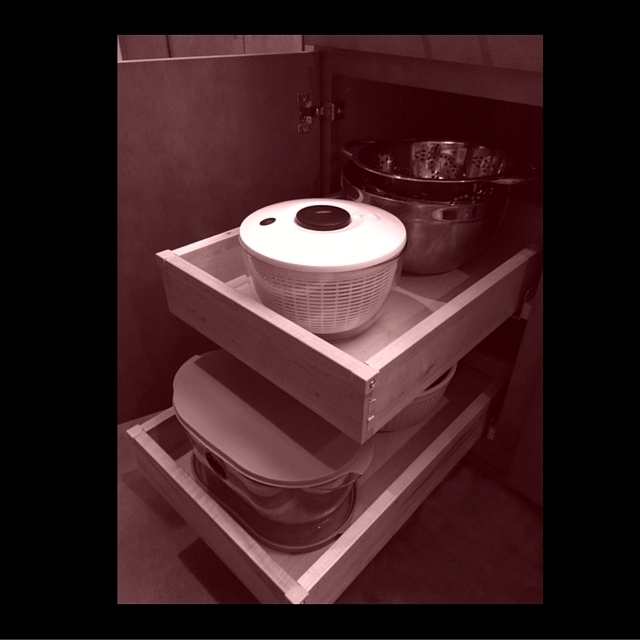 You can have speedy access to your washing devices such as salad spinners, large bowls and colanders by simply outfitting a base cabinet adjacent to the sink with deep roll out trays. This way, everything you need is right next to the sink and you don’t even have to dig for it! And, if you line the bottom of the tray with a towel, you can give the salad spinner a quick rinse after using it and put it back immediately. If you leave the lid ajar it’ll dry in the cabinet and your counters will stay clear. 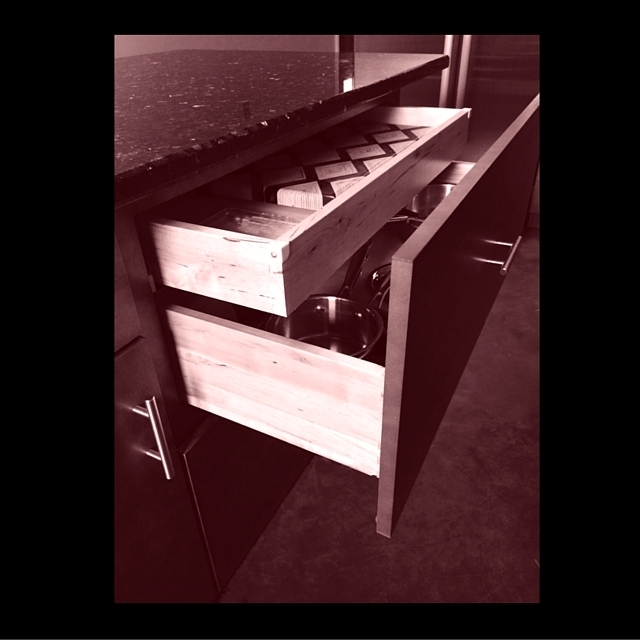 Make sure the cabinet is at least 18” wide (or larger if you’re an extra large bowl kind of person,) and have the drawers assembled so that there is enough interior height to accommodate your highest bowl. Washed produced shortly thereafter needs to become chopped produce. Quick access to cutting boards is clutch in this situation. Sanitary concerns dissuade most from keeping their boards permanently on the countertops. Plus, cross contamination possibilities necessitate using more than one board anyway. So, a storage spot closest to – but not on – the countertop would be ideal. 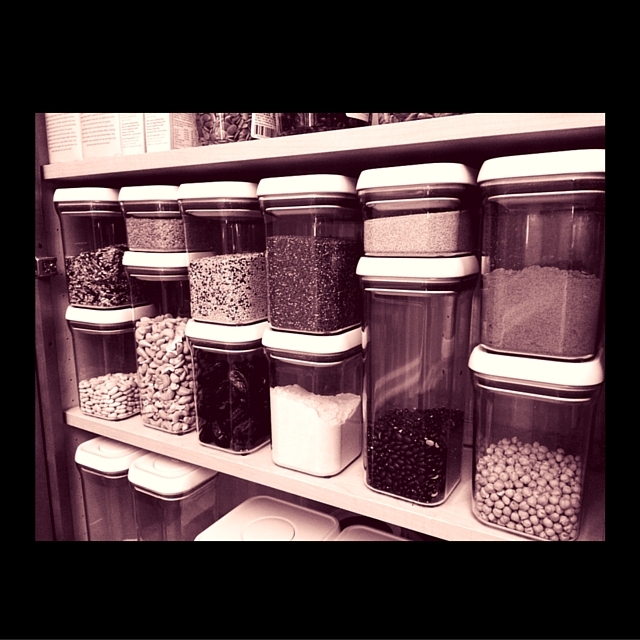 As your diet becomes less about processed foods, your cupboards will become less about packaging. Most of your nuts, seeds, grains and beans will be transported home from the store in bags instead of boxes and packets. Since bags don’t stack, they are buggers when trying to make the most of your precious pantry space. Many people have embraced stackable airtight containers just for this reason. Not only can you see what’s inside them, they maximize the space you have, and let’s face it, look really snazzy when organized neatly! To fully take advantage of your containers, it’s key to install the pantry shelves in accordance to the height of your containers. Measure them before your first meeting, so your designer can determine how many shelves the pantry will require. If you don’t already own containers this will give you an idea: the shelf in the below image has a height clearance of 13.25″. This dimension fits (2) .9qt stacked containers, as well as (1) 1.5qt stacked with (1) .3qt. (OXO brand containers.) Also, for reference, an 11″ deep pantry shelf allows for 2 rows of these container, so the space is utilized to the max. This is not exclusively a “healthy eating” design tip, but a good one to think about while you’re in the planning phase nonetheless. Be conscientious about the location of your food pantry or cabinets where your food will be stored. Often times, depending on your climate or the age of the house, pantries along any exterior walls of the house can experience extreme temperature swings. Bread, cereal, dates, nuts, etc. kept in these cabinets can heat up quickly in the summer months, resulting in them quickly going stale. On the flip side, these items can get very cold, also messing with the consistency and texture of the food. Keep that in mind when determining the placement of your food cabinets. Sometimes locating the pantry on an interior wall might be best, when given the choice. This might not be that important to everyone, and it might not be feasible depending on the available natural light. However, if you live in a climate where outdoor herb growing only happens a few months out of the year, you might want to add this on your wish list before construction begins. If you have a corner sink with a window, the work is already done for you. You’ll have plenty of space behind your sink for an herb garden. 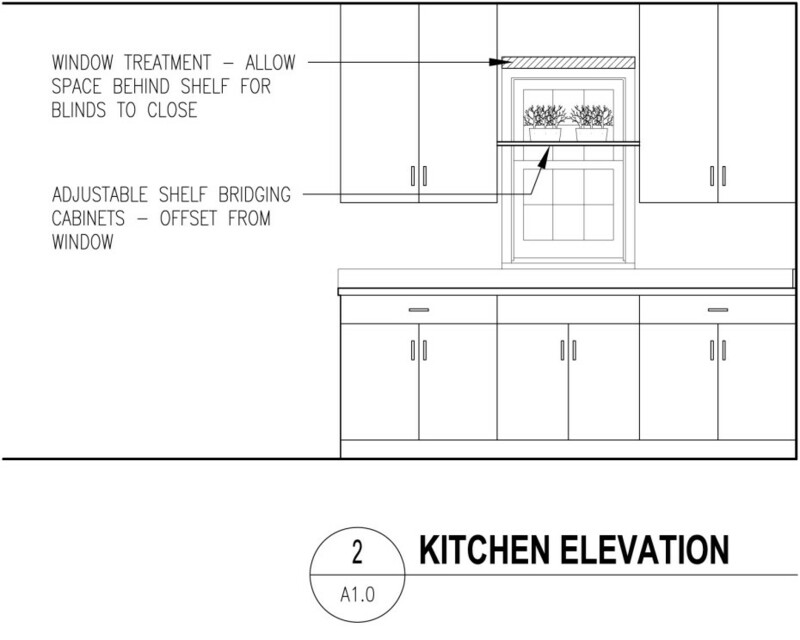 If you happen to have a window between two cabinets, however, you might want to ask your contractor for a bridging shelf. Be sure to have it built far enough out so there is still room for a window treatment (and the pull) between the shelf and the window. Know anyone about to renovate their kitchen? Drop them a tip or two! Because it's hard to take a vacation from health.